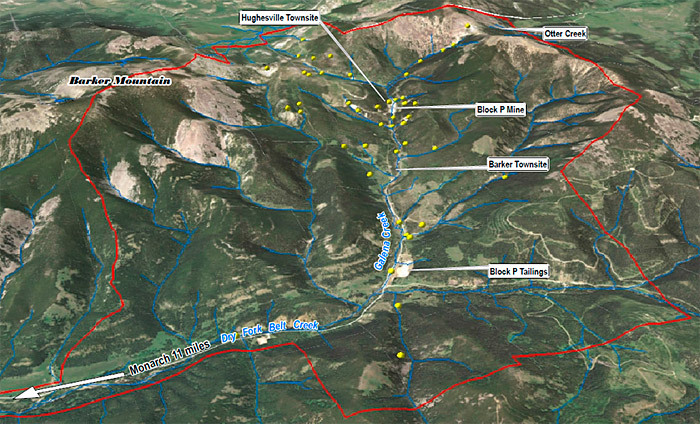 The Barker Hughesville Mining District Superfund site is in the Little Belt Mountains in west-central Montana, about 40 miles southeast of Great Falls and about 10 to 12 miles east of the town of Monarch. Detailed information on the site is presented in the Remedial Investigation report (USEPA 2016g). In brief, the site is renowned for its rich mining legacy and prospered through the later part of the 19th and early 20th century. Silver and lead were discovered in the Galena Creek drainage in 1879, and by the next year the area had several hundred claims. Silver and lead mining boomed in the 1880s and 1920s, and continued sporadically into the 1940s. Historical mining camps in Barker and Hughesville, located along Galena Creek, were home to miners who worked at nearby mines and ore processing facilities. A smelter near Barker operated from 1881 to 1883. Mining tapered off around 1883, after the depletion of surficial ore bodies. Operations resumed upon completion of a rail line between the site and the Great Northern Line in Monarch, with periods of increased activity in the 1920s and early 1940s. Large-scale mining in the area ended in 1943 when all operations ceased. This area contains approximately 46 abandoned mines strewn with waste rock dumps, tailings, and seeping mine adits (see Figure 11-12). Figure 11‑12. Barker-Hughesville Mining District Site location and layout. Mining operations typically generate several different types of solid waste, including waste rock, mill tailings, and streamside tailings. These mine wastes often are found to contain elevated levels of several different metals. Excess exposures to these metals are known to cause a range of noncancer and cancer effects in humans, so people who live within or visit the site could be at risk of adverse health effects. The two main sources of contamination from former mining activities include (1) deposits of tailings and waste rock that were placed onto soil near the mines or were discharged into nearby streams and (2) discharges of contaminated water from mine adits. Fine-grained solid wastes may be released into air by wind erosion and human disturbances. Solid wastes erode into streams, resulting in contamination of both surface water and stream sediments. Contaminants in soils or sediments may be taken up into the tissues of plants or game animals. Contaminants in soils or sediments may be dissolved by water (rain or snowmelt) and enter surface water and may infiltrate into groundwater. The site is rural and mostly forested and is surrounded by rugged mountains with steep slopes ranging in elevation from 4,700 to 8,309 feet. Most of the area is public land in the Lewis and Clark National Forest, administered either by the USFS or the U.S. Bureau of Land Management. Private lands in the Galena Creek watershed are predominantly patented mining claims whose surface mineral rights are privately owned, although there are several structures along Galena Creek in the areas of Barker and Hughesville that are used seasonally by area residents. The Galena Creek watershed is used recreationally in the summer months (mainly between Memorial Day to Labor Day) for a variety of activities, including camping, hiking, horseback-riding, and riding all-terrain vehicles (ATVs). Outside of Monarch, private land available for residences is limited, and it is not expected that future residential development near the site is likely to occur. USEPA performed an initial evaluation of human health risk at the site in 2010 (USEPA 2010a). The exposure area of principal concern evaluated in this assessment was the Galena Creek watershed and its tributaries, and the populations evaluated included seasonal residents in Barker and Hughesville as well as several types of recreational visitors to the forest and streams of the area. A baseline human health risk assessment (BHHRA) for the site was completed in 2016 (USEPA 2016b). The exposure pathways that were evaluated in the BHHRA for one or more receptors included ingestion of soil, mine waste, and sediment, ingestion of surface water and groundwater as drinking water, inhalation of airborne dust (ATV riders only), and ingestion of locally harvested fish and game (fishers and hunters only). Numerous samples of soil, mine waste, sediment, surface water, fish tissue, and groundwater have been collected at the Site. There were several metals identified in the BHHRA as chemicals of potential concern (COPCs) for soil and soil-like media (sediment, tailing, other mine waste), surface water, and groundwater. These metals included aluminum, antimony, arsenic, barium, beryllium, cadmium, chromium, cobalt, copper, iron, lead, manganese, mercury, nickel, silver, thallium, vanadium, and zinc. This case study summarizes the risk characterization approach and results for lead. Table 11-8 presents summary statistics for lead in soil, mine waste, and sediment. As shown, mean lead concentrations were highest in the streamside tailings and sediment, but soils from residential yards were often higher than 400 milligrams per kilogram (mg/kg), which is the default USEPA residential screening level for lead in soil. This screening level assumes a default relative bioavailability (RBA) of lead for soil and soil-like media of 60% (USEPA 2007b). The incidental ingestion of soil, mine waste, and/or sediment was evaluated for every receptor. When quantifying exposure from ingestion of lead in soil and soil-like media, the risk estimates were adjusted to account for the site-specific relative bioavailability (RBA) of lead. The RBA of lead was estimated by measuring the amount of lead which solubilized during an in vitro bioaccessibility (IVBA) analysis. This IVBA extraction procedure was performed in accordance with the methods described in USEPA (2007b). There were 17 different soil samples, including residential yard soils, mine waste soil, and roadway soils, evaluated during the lead IVBA analysis. Table 11-9 presents the soil lead concentrations and resulting lead IVBA values for each individual soil sample. Lead IVBA values were variable, with individual results ranging from 2 to 74% (USEPA 2016b). Table 11-9 presents the estimated lead RBA values for each individual soil sample as well as the mean lead RBA estimate for each soil type (EPA 2016b). Despite the variability in the individual sample RBA results, which ranged from <1% to 63%, the mean RBA values for residential yard soil (22%), mine waste (23%), and roadbed soil (21%) were alike. Because the main source of lead contamination in soils at the site is mine-derived waste material, these RBA values were averaged to yield a single RBA value of 22% that was assumed to be applicable to all soil and soil-like materials. This value is lower than the USEPA default value of 60%, suggesting that lead at the site is in a form that is less readily absorbed. USEPA recommends the use of toxicokinetic models to correlate blood lead concentrations with exposure and adverse health effects. The IEUBK model is recommended to evaluate exposures from lead-contaminated media in children in a residential setting (USEPA 1994d), and the ALM is recommended to evaluate potential risks from lead exposure in adults (females of child-bearing age) (USEPA 2003b). Both the IEUBK model and the ALM can be used to predict blood lead concentrations in exposed individuals and estimate the probability of a blood lead concentration exceeding a level of potential concern. USEPA has identified a blood lead level of 10 µg/dL as the concentration level at which effects begin to occur that warrant avoidance, and has set a goal that there should be no more than a 5% chance that a child will have a blood lead value above 10 µg/dL (USEPA 1991c; 1994d; 2013c). For convenience, the probability of a blood lead value exceeding 10 µg/dL is referred to as P10. The site-specific soil RBA value of 22% (or ABA value of 11%) was used when predicting potential blood lead levels from site exposures to soil and soil-like media (USEPA 2016b). 11.11.5 How Did Bioavailability Results Affect Site Decisions? Detailed risk estimates for all COPCs are presented in the BHHRA (USEPA 2016b). Table 11-10 summarizes the estimated lead risks for recreational (Panel A) and residential receptors (Panel B) based on the arithmetic mean exposure point concentrations. The BHHRA also included P10 estimates based on exposure point concentrations calculated as the 95% upper confidence limit on the mean, which resulted in even higher P10 values, but did not change overall conclusions about the exposure populations of potential concern. Risks from lead to hunters and fishers were also within USEPA’s health-based goal (P10 ≤ 5%). P10 values slightly exceeded USEPA’s health-based goal for hikers (5.8%) and ATV riders (5.4%) in the Galena Creek/McKay Gulch area, and for campers along Galena Creek (5.2%). The primary exposure pathway for hikers and campers is the assumed ingestion of lead in water from Galena Creek if creek water was used as a source of drinking water. This pathway is not considered to be especially likely because people hiking and camping in the area generally bring potable drinking water. The primary exposure route for ATV riders is incidental ingestion of mine waste, with a smaller contribution from inhalation exposure. The lead modeling results showed risks from lead in soil and indoor dust appear to be well below USEPA’s health-based goal (P10 ≤ 5%) for residential children living year-round in the community of Monarch, as well as children living seasonally near Barker and Hughesville. However, if groundwater from wells in the Barker/Hughesville area were used for drinking water in the future (they presently are not used for drinking), risks from lead would be substantial, with P10 values from 45% to 60%. Although several of the residential properties sampled had mean soil lead concentrations above the default residential soil screening level of 400 mg/kg, when site-specific lead RBA was considered, the resulting lead exposures were predicted to yield blood levels that were below a level of concern. These results suggest lead in residential yard soil is not likely to be an important risk driver for either year-round or seasonal residents. These results illustrate that site-specific estimates of lead bioavailability can reduce the overall spatial extent and amount of materials that may need to be addressed as part of the site remedial action. Currently, the site feasibility study report and record of decision have not yet been finalized. Site managers still must consider potential exposures to other chemicals of concern, as well as soil and mine waste exposures for lead to hikers and ATV riders in the forested areas and campers along site creeks. USEPA is in the process of developing site-specific cleanup levels. The derivation of these risk-based cleanup levels for lead in soil and mine waste accounts for the site-specific lead bioavailability as determined from lead IVBA results. Preliminary cleanup levels for lead in soil and mine waste range from about 8,800 to 20,000 mg/kg, depending upon the type of recreational receptor (SRC 2014).